It would seem that keeping a journal on campaign was obligatory for officers of the Guards regiments as so many of them have now been uncovered. However, every journal has its own merit and its own particular take on the momentous events they witnessed. Ensign John Drummond’s journal is just the latest to appear, but its freshness, unaltered state and particularly unique accounts of weather observations make it stand out from the others. I was therefore very pleased to have the opportunity to work on this journal alongside Colin Yorke who discovered it, when brought in by the family to have it rebound. Through his hard work, the journal has been transcribed and permission gained to publish it, I have simply helped Colin in the processes of publication and suggested a number of corrections and footnotes to aid the reader. John Drummond of the Boyce in Gloucestershire was born on 5th October 1793, the son of John Drummond esquire, who had married Susan Fane, the eldest daughter of the 9th Earl of Westmoreland in 1788 but she died having given birth to our John and his sister Susan before she died in 1793 quite possibly from complications whilst giving birth to John. John was educated at Harrow and then gazetted as an ensign on 22nd November 1810. He served in the Peninsula with the Coldstream Guards from December 1812 until the end of the Peninsular War in 1814 and was present at the battles of Vitoria, the crossing of the Bidassoa and battles of Nivelle and Nive, the investment of Bayonne and the repulse of the sortie there. He eventually received the General Service Medal with three Clasps for Vitoria, Nivelle and Nive. 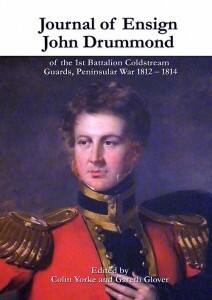 He was promoted to Lieutenant & Captain on 26th May 1814. He also served with the army in Holland in 1814 and the Army of Occupation in France. He became a Captain & Lieutenant Colonel on 22nd June 1826; he exchanged to half pay on 13th April 1832. He became a Colonel on 23rd November 1841, a Major General on 11th November 1851, a Lieut. General on 26th October 1865 and a full General on 10th February 1865. He married Georgiana Augusta Finch on 5th May 1821, the illegitimatedaughter of George the 9th Earl of Winchilsea, and inherited the title of ‘Chief of the Drummonds of Concraig and Lennoch’. They had two daughters, Georgiana Matilda and Sophia Anabella. He became a Magistrate for the County of Gloucester. He died at Boyce Court, Dymock, Gloucestershire on 15th April 1875 and is buried at St. Mary’s, Dymock. His General Service Medal was auctioned at Glendining in 1952.